The Greater Mekong Subregion Business Summit was jointly organized by the Vietnam Chamber of Commerce and Industry (VCCI) in collaboration with the Ministry of Foreign Affairs on March 30, 2018 on the sidelines of the 6th GMS Summit and the 10th CLV Conference. This is the first time the GMS Business Summit is organized under the initiative of Vietnam. The summit was attended by the President of Asian Development Bank (ADB), the ASEAN Secretary-General, Executive Director of the World Bank (WB) and representatives of nearly 100 international organizations and development partners. In particular, the summit attracted more than 2,000 enterprises inside and outside the GMS region, and representatives of nearly 40 provinces and cities. About 300 domestic and international reporters attended and covered the summit. The summit included plenary sessions and breakout sessions that focused on urgent issues for GMS development such as defining new drivers for economic growth amid a changing world, modern agricultural development, and financial sources for infrastructure development. Prime Minister Nguyen Xuan Phuc attended and chaired the GMS Government - Business Dialogue. Following the success of the first edition in 2017 in Da Nang City, VCCI organized the Vietnam Business Summit 2018 (VBS 2018) on September 13, 2018 on the sidelines of the World Economic Forum (WEF) on ASEAN Summit 2018 themed “Vietnam - We mean business: Connect and Innovate”. The meeting emphasized the entrepreneurship and the Fourth Industrial Revolution as new driving forces in global economic development. VBS 2018 wrapped up with a great success. The event was attended by more than 1,300 delegates, including more than 500 international delegates from the World Economic Forum (WEF) and business delegations from the United States, South Korea, China, India, Chile and Oman, and leaders of foreign businesses in Vietnam as well as representatives from embassies, diplomatic and economic missions and international organizations in Vietnam. 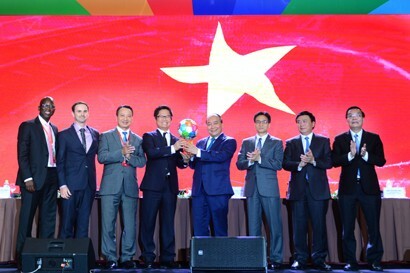 The success of VBS 2018 not only contributes to enhancing Vietnam's reputation internationally, promoting Vietnam's image as an important linkage of global value chain to international investors but also affirms VCCI’s role and brand as a focal point for Vietnamese businesses to reach out to the world. This is an important premise for Vietnam to host VBS 2019 and make it an important annual event of domestic and foreign business community. The forum was organized by the Vietnam Chamber of Commerce and Industry (VCCI) and the Korean Chamber of Commerce and Industry (KCCI) as South Korean President Moon Jae-in, accompanied by a business delegation of more than 200 leaders of leading corporations, paid an official visit to Vietnam from March 22-24, 2018. At the forum, the two sides discussed cooperation in investment, trade and tourism cooperation while providing the chance for enterprises of both sides to initiate investment and business contacts. The forum was attended by more than 750 business delegates including big Korean corporations who continued to see Vietnam as an attractive investment destination. In 2018, VCCI continued to carry out the Action Program on implementation of Resolution 35/NQ-CP on business support and development to 2020. VCCI carried out all five assigned tasks and coordinated with relevant agencies, business associations and business community to implement resolution solutions. As of November 30, 2018, VCCI directly gathered 701 petitions from enterprises and associations across the country through information channels. According to VCCI, by the end of November of 2018, 546 petitions or 77.89% were handled. Proposals from enterprises and associations focused on such issues as advancing administrative reform and business facilitation; providing a favorable environment for businesses and supporting innovation; ensuring business rights, equal rights to access business resources and opportunities; reducing business costs for businesses; protecting legitimate rights and interests of enterprises. The National Conference on Sustainable Development 2018 organized by VCCI with the theme of “Enhancing competitiveness, realizing sustainable development goals amidst industrial revolution 4.0” designed to facilitate and promote public-private partnerships to deliver global sustainable development goals by 2030, achieve green growth and scale up the introduction of global solutions. On this occasion, representatives of the Ministry of Planning and Investment and the Vietnam Chamber of Commerce and Industry announced the launch of the Partnering for Green Growth and the Global Goals 2030 (P4G). After the conference, VCCI submitted six recommendations to the Government on policymaking for better national competitiveness and sustainable development support, contributing to realizing sustainable development goals. Prior to the enforcement of new-generation free trade agreements (FTAs), in 2018, VCCI carried out many activities to support the business community on issues related to these agreements. VCCI consulted the business community on international trade agreements, composed nine publications and business manuals on “Comprehensive and Progressive Agreement for Trans-Pacific Partnership (CPTPP),” “FTA commitments for footwear enterprises,” and “Rules origin and procedures of origin in less developed countries.” VCCI joined and delivered presentations at 23 seminars and conferences on free trade agreements to which Vietnam is a signatory, including CPTPP, ACFTA-AHKFTA and EVFTA; compiled 20 comments and researches on integration; carried out communication campaigns on CPTPP at the back of the National Assembly’s ratification on mass media channels like VTV1, VTC10, National Assembly Television, newspapers and magazines. These activities supported enterprises with legal issues of concerns on economic integration, especially the use of anti-dumping, anti-subsidy and safeguard measures as well as general remedies to trade in Vietnam and the world.